A tour of Henry Francis du Pont’s former extraordinary home was my destination this year to enjoy holiday style decorations. An eighteen room dollhouse, fully decorated with Christmas treasures and other handmade pieces was one of the draws for me. Another was the large fir in the Conservatory decorated with hundreds of multi hued dried flowers that looked as fresh as if just picked. The iconic ‘Dried Flower Tree” is a tradition for Winterthur and people are amazed when they see it. 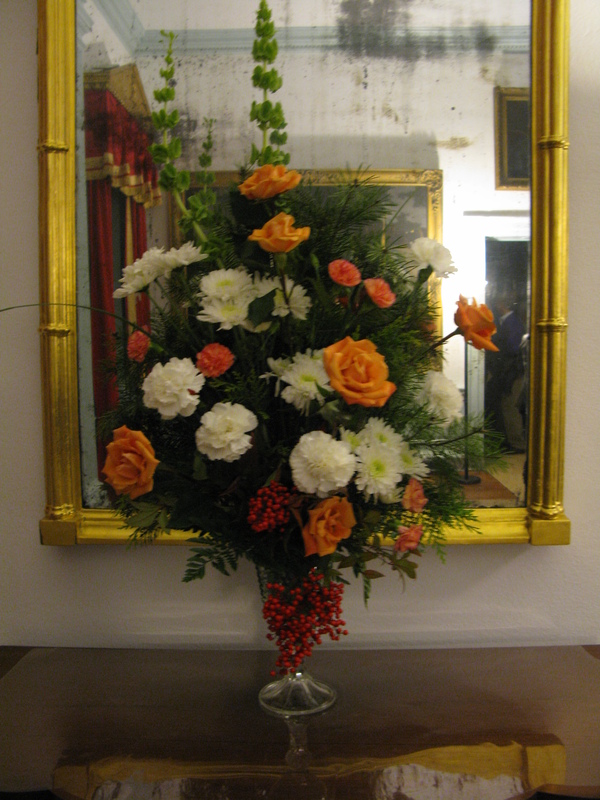 Arrangements are placed throughout the house all year-long with fresh flowers, and after they have done their duty in the floral designs, the flowers are taken to the basement of a cottage on the property and dried in the room dubbed “The drying room”. Serving double duty, these flowers once arranged on the tree creates a multi hued rainbow effect that is stunning. For the actual process of decorating this tree, which started in 1986, look at the video. Most of the flowers are picked on Winterthur’s property throughout the year and either air-dried or dried with silica gel, a crystalline dessicant. Starting in March/April with the daffodil, any flower that can be dried is used for that purpose. Everything is then packed into a fumigant tent for three weeks, starting in early October, to kill any pests. In late October, the flowers are brought out and organized by color into long boxes. Starting with the topper, the staff works all around the tree, bunching many of the flowers for a bigger impact. Special flowers like peonies and roses are placed singly on the branches, wired for stability. Queen Anne’s Lace, peonies, daffodils, and zinnias are dried for ten days with silica gel as these don’t dry well with air drying. Others like larkspur, yarrow, billy balls, safflower, cockscomb, money plant, hydrangea, and Chinese lantern are air-dried in a dark place for about a week and then are packed away until ready to be used. For hours and more information about Winterthur, go to Yuletide at Winterthur. 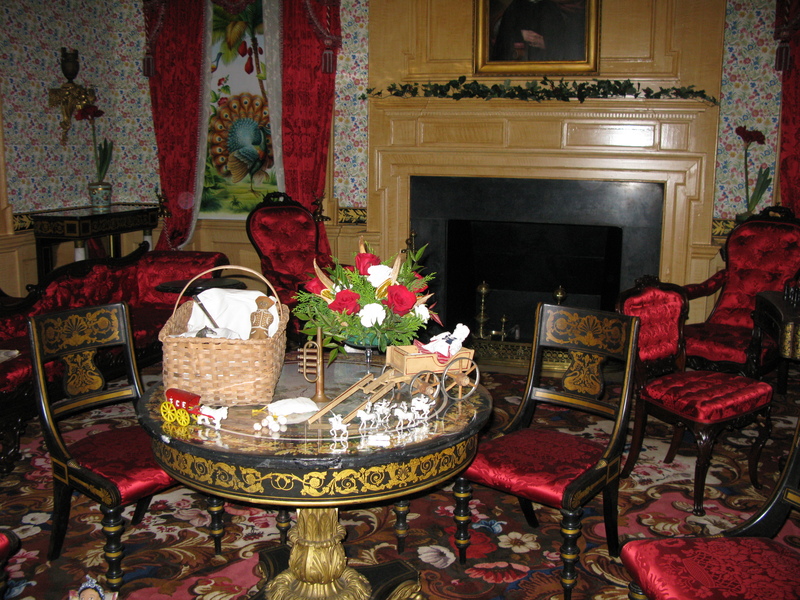 Next post will be on the miniature Christmas decorations in the dollhouse at Winterthur. If you have never been to the Hampton Court Flower Show or other iconic English gardens, read on if you want to check this off on your bucket list. For a full rundown on my recent trip to the Chelsea Flower Show, and gardens in the Cotswolds and Wales, you need to check out my post. Sussex, Norfolk, Kent, Essex, and Suffolk, have some of the most beautiful and famous gardens of England, and you owe yourself a trip there. If you are serious about things of a horticultural nature, then look no further than my upcoming tour of Hampton Court Flower Show & English Garden tour. The English know how to garden, and for them it is a blood sport when they display at garden shows. And we have a full day at the Hampton Court Flower Show on Royal Horticultural Society members day only. That means less crowds to deal with! Starting with the Hampton Court Flower Show which is the largest of its kind in the world, we travel to Kent, the ‘Garden of England’, to visit Chartwell, the family home of Sir Winston Churchill. Pictures, books and personal mementoes evoke the career and wide-ranging interests of this great statesman, writer, painter and family man, while the hillside gardens reflect Churchill’s love of the landscape and nature. You may be able to spot the black swans that have been there since Churchill’s time. Sussex, Kent, Norfolk, and Surrey are a treasure trove of beautiful stately gardens surrounding grand estates, some like Leonardslee Lake & Gardens that has roaming wallabies and a one of a kind miniature/dollhouse exhibit. Closed for many years for a major renovation, Leonardslee is open for the first time in many years, and I can’t wait to tour it. Great Dixter is one of my favorite gardens included, the garden of the late plantsman Christopher Lloyd. So many containers are packed into this garden, the containers become a huge feature. The flower filled borders are some of the prettiest in England. Many other iconic gardens are included with a total of 14 gardens, Ely Cathedral, Sutton Hoo archaeological site and a nature boat trip down the Norfolk Broads to see the countryside. Also an afternoon cream tea at the famous at the famous Essex Rose Tea House is included- a lot to pack in for 10 days! My tours are for small groups, are all by coach and we stay at 4 star hotels. I have a wonderful tour guide who has been with me for four tours and makes all of our visits a delight and very informative. We have a lot of fun exploring medieval towns and the countryside and experience England’s centuries-old fascination with gardening. Visiting the Delaware Botanic Garden in year two, one year later than my original visit, was an eye opener in the evolution of a major public garden. Even working as a landscape designer/installer, I was surprised at the great strides the difference of a year makes. For my first year post, go to DBG-From the Ground Up. The first thing that hits you as you enter is the wild centerpiece garden- The Meadow Garden- full of thousands of perennials that have matured with just 18 months or less of growth. Pollinators were zipping and buzzing around me as I wandered the winding pathways. World renowned Dutch garden designer Piet Oudolf designed the showpiece Meadow Garden. The Master Plan describes it as “an exuberant palette of mostly native ornamental grasses and herbaceous flowering plants that will create spectacular four-season color and textural saturations against a distant horizon”. An old planting adage is “1st year-sleep, 2nd year-creep, and 3rd year-leap” and this second year is more than “creep”. All the perennials in the Meadow Garden have absolutely “leaped” this second year and appeared very established. Located on a sunny 2-acre area adjacent to the woodland edge, the goal was to plant sixty-five thousand herbaceous flowering plants and ornamental grasses to provide multi-season interest. The first thing that visitors will see entering DBG, the Meadow was completed this spring except for some small patches, with volunteers. It is already an undulating textural mass. The close planting will discourage weeds as the herbaceous perennials knit together as a ground cover. Before the perennials form that weed smothering ground covering, opportunistic weeds, notably ‘dog fennel’ (Eupatorium capilifolium) have taken hold between the plants and tower over some of the new plantings. Volunteers were out in force when I visited recently and were pulling stinky dog fennel on a 95 degree humid day. Not fun for some 265 volunteers that work there throughout the year! Fortunately portable tents are set up to cast some much-needed shade and there is a camaraderie evident in everyone you speak to. The native perennials are thriving and even in mid August when color is hard to find in a perennial border, texture and color abounded throughout the insect heavy plantings. Camera in hand, it was hard to keep up with all the native pollinators that were buzzing around. Brand spanking new hoop houses were just erected with a gravel base that can be put to use this winter in growing new transplants (plugs), cutting propagation, and overwintering of young, frost susceptible plants. Eradicating invasive plants, installing pathways, careful tree removals, and shade plantings have been progressing in the Woodland Garden. With a phased implementation of DBG, the Meadow Garden is the first phase and the Woodland Garden is close behind, so intensive shade loving plantings are being installed along the newly placed pathways. Curving volunteer constructed stone walls make a nice addition as well as holding soil in place along many of the pathways. Some areas of the Woodland Garden will showcase only native plants and others will contrast natives along with non-native plants from Asia and Europe. Plantings will be planted from the upland areas to the nearby water’s edge of Pepper Creek. Trimmings and prunings are being recycled and reused as sculptural elements in bird’s nest structures and a porcupine “tree” is a sculptural stopping point on the path. A wetland area will be an outdoor classroom called the “Learning Garden”. A high school class of seniors has already been hosted in a learning experience there. Interactive programs and living classrooms encouraging active involvement with nature is a major component of the DBG goals. There have been no applications of fertilizers, pesticides or fungicides thus far. For pathway weeds, a 20% Horticultural vinegar was used which was quite effective. A projected opening date of September 2019 is only a year away and lots of money and volunteer hours will be needed in the meantime. A fall tree planting campaign, planting of the dune gardens, and the east woodland border are next on the agenda. Frequent fund-raising is being done to feed the volunteer efforts and plantings. If interested in donating, go to Make a donation. This is an exciting opportunity to get on the ground floor supporting or volunteering at the incredible new Delaware Botanic Gardens. Two years in the making, the revamped and rebuilt 5 acre fountain display of Longwood Gardens is ready for prime time. Major new renovations that incorporate new technology have energized the old Longwood Gardens fountains into an unforgettable experience. According to Longwood Gardens website; “The culmination of the legacy and vision of Pierre S. du Pont, the garden combines classic landscape design with art, innovation, technology, and extraordinary fountains. Spectacular events, glorious gardens, live music, special exhibits, and jaw-dropping fountain performances await”. If you have never been to Longwood, their vision is clear; “To become a world apart, a place accessible to all is the driving force behind all we do to ensure we preserve and enhance this extraordinary experience for future generations”. Home to more fountains than any other garden in America, this is an experience that you won’t see anywhere else. New fountain engineering and lighting technology that weren’t available in the thirties transformed the fountains to the digital age. I remember the fountain display from years ago and I wasn’t prepared for the new and improved version with shape shifting columns of water. On a recent humid summer night I got my chance. Sitting in a reserved seat, I had a perfect view of the recent renovations complete with fireworks, fountains, and music. ‘Dancing Divas’ was the theme and the fountains literally danced! Waves of undulating water streams throbbed to the music punctuated by eye dropping fireworks. LED lights produce colors that weren’t possible when the fountains were designed and there were bursts of water propelled by compressed air and flames of propane gas that flare atop columns of water- Fire & Water! Designed by Pierre du Pont and first turned on in 1931, the $90 million revitalizing project began in October of 2014 and opened with great fanfare this spring. Lots of new jets were added (1,340) and the tallest jet went from 130 feet to 175 feet. 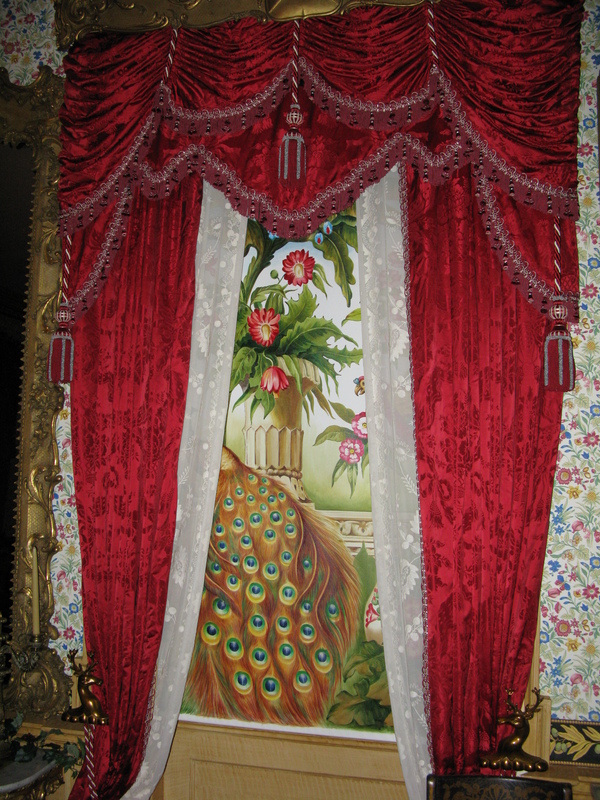 The basket weave effect (pictured above) was added, a “Hidden Layer Dancer” and “Dancer on the Stage” were added, which means a nozzle moves side to side and front to back to make beautiful gyrations that are put to full use. The fountains did dance. Daily fountain performances with additional special evening shows Thursdays through Saturday showcase the new fountain experience. The Historic Pump Room & Gallery highlights the original pump systems that powered the main fountain garden from 1931 to 2014 and gives you a behind the scenes look at the powerful equipment required of the old fountains. I loved the fountains, but walking through the totally redone first garden of Mr du Pont was my pleasure of the evening. A celebration of annuals and perennials and a wonderful dahlia garden that was at its peak in August drew my attention and many photos later I joined my family at the Beer Garden for refreshment. Returning for Thursday to Saturday evenings, the Beer Garden was a perfect spot to sit with friends and family for wine/beer and wood fired pizza and bratwurst. I have been to a real Beer Garden in Germany and this was very similar in ambiance and flavor. The spiritual center of the new fountain display has to be The Grotto. Meant to be a place of reflection, it includes four fountains, including one that falls from the ceiling. Framed in limestone walls, all of the old crumbling statues and carved wall fountains at the main fountain garden’s base, had to be removed and either replaced or rebuilt by craftsmen. New plantings of boxwood were added and the old invasive Norway Maples that have fallen out of favor were replaced with Lindens. Longwood Gardens is off Route 1 in Kennett Square, Pa., and contains more than 1,000 acres of gardens, woodland, idea garden, hillside garden, meadow and conservatories. In the Main Fountain Garden, 12-minute fountain shows are held daily at 11 a.m., 1 p.m., 3 p.m. and 5 p.m.
Thursdays through Saturdays, when Longwood is open until 10 p.m., there is a 12-minute show at 7 p.m. and a 30-minute show at 9:15 p.m. The last show has illuminations. Special tickets are required for the Fireworks & Fountains Show. Now in its 8th year, the Garden Festival at Ladew Gardens in Monkton, MD, has become the most anticipated specialty plant and garden ornaments sale in the region, featuring an eclectic variety of vendors who specialize in unusual and unique plants and garden related items. Garden Festival guests can shop from more than 45 vendors offering hard-to-find perennials and annuals, unusual exotics and container specialties, decorative garden furniture, urns, statuary, and other architectural treasures. I attend every year and get lots of ideas, buy many plants, and meet like-minded plantaholics. You don’t get many casual plant shoppers here, but knowledgeable plant fanatics. Attending the lectures and workshops is an added benefit, but I am usually so busy shopping that I don’t have time to attend. After shopping, I also stroll through Ladew’s beautiful historic gardens known for the sculpture of shrubs into fantastic shapes. I am always searching for the latest and greatest plants and I am sure to find them at Ladew – at a cost though. The prices aren’t cheap, but you will find things here that you can’t find anywhere else, so I am careful about what I purchase. Since I usually buy wholesale plants, I always get sticker shock when I see retail prices. Forget carrying all those heavy purchased plants around as Ladew volunteers collect your plants in wagons and take them to the parking area where you can drive up and load them up. I still take my portable cart with me as once it is full, I stop! Ladew is always looking for quality vendors, and there is usually new ones as well as old favorites. The fairy garden vendor is especially charming and I always stop and admire the miniature gardens. This year the Festival will be held Saturday, May 7, from 10 AM to 4 PM at 3535 Jarrettsville Pike, Monkton, MD. For more information, go to Ladew Gardens. This is your opportunity to find plants and ornaments that are rare and beautiful to make your garden a unique place. Where else can you find miniature hostas? Every year, I help with the decorating of “The Palace in the Woods”, Hampton National Historic site in Towson, Maryland, for their Yuletide celebration. Dating back to the eighteenth century, Hampton is a large estate built in the Georgian architectural style, situated on many acres including a farm, greenhouses, slave quarters, an orangery, large Italianate gardens, horse stables, cemetery, and an English style park-like setting. Built as a country seat just after the Revolutionary War by the prominent Ridgely family, the house and its immediate surroundings are just a remnant of the Hampton estate of the early 1800s. Decorating the Mansion along with the Park service is a lot of fun, and gives me ideas on decorating my house with fresh greens, garland, natural materials, and fresh flowers and fruit – all materials that were used back “in the day”, Williamsburg or Colonial style. Located in the music room, the Christmas tree exudes Victorian elegance with the hand-made ornaments reflecting the ornate Victorian era. The screens in the background are hand painted with colorful scenes and the furnishings reflect the lavish decorating in vogue at that time for the very wealthy. 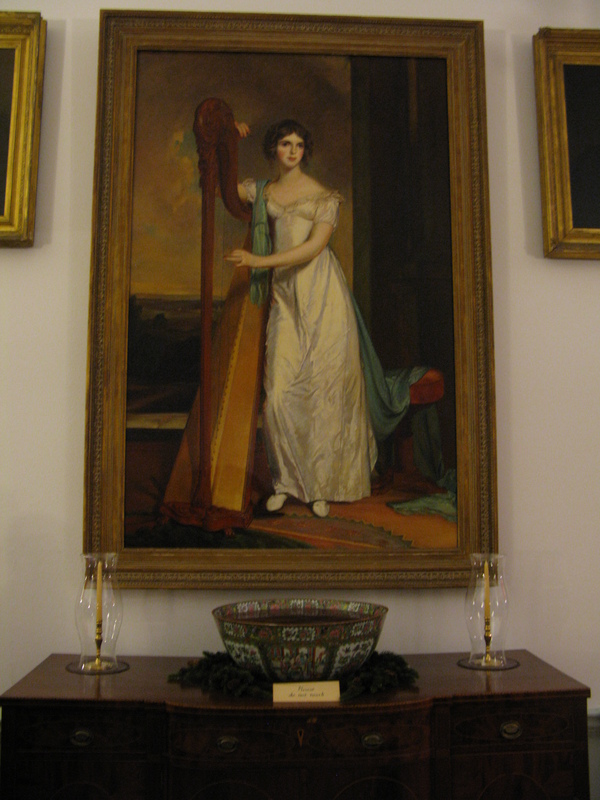 The mansion showcases Mid-Atlantic life from before the American Revolution to after World War II. Place settings are in the cranberry colors befitting the Yuletide season, and sideboards and tables are set with the house silver and groaning with food ( good quality fakes), but set up for a typical Christmas spread of the period. The Federated Garden Clubs of Maryland take charge of the festive greenery decorations, as well as the fresh floral arrangements, all with the time period in mind when choosing materials. Slated to be restored in the near future, the dilapidated greenhouses were used by the Ridgelys used for out of season food and forcing flowers. Many of the clubs of District III, Baltimore and Harford County, participate and get together to carefully decorate the towering Christmas tree and make lots of labor intensive boxwood wreaths and arrangements. We meet in the old Orangery to work our magic on beautifying the mansion. Armed with fresh-cut greens, we bring cut flowers, greens, and cutters. 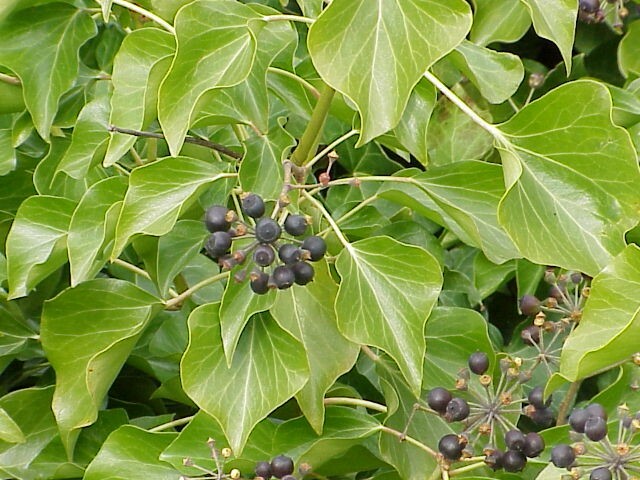 The Park Service also will cut some special greens from the surrounding landscape, like ivy berries, holly, and boxwood, which are beautiful and were certainly used when the Ridgely family lived there. At night the mansion is full of musicians, carolers, and docents who will answer questions about daily life of the Ridgelys, as well as the many slaves who lived on the grounds. The Hampton estate was the home of the Ridgelys through seven generations, and also of the enslaved people, indentured servants, and paid laborers who supported them, from before the American Revolution to after World War II. Orchids are at their peak at the end of winter/early spring and the various botanical gardens make the most of it. Longwood gardens has their opus and the New York Botanical Garden chimes in with their twist. And their twist is stunning! Orchid Chandeliers were touted as the star and just look up and you will see the beautiful ceiling mounted floral creations that make your jaw drop! – Aerial flowers! As soon as you step foot into the conservatory, cylinders and enormous hanging creations with a kaleidoscopic symphony of colorful orchids such as Cattleyas and Phalaenopsis are framed by the magnificent architecture of the crystal palace Conservatory. There were other chandeliers, like the Staghorn ferns! Guerlain, a perfume and makeup company teamed up with the New York Botanical Garden on its Orchid Evenings to promote its orchid scent focused on the flower. And talk about fragrance! It was wafting everywhere in the conservatory. All the orchids were so fragrant, I couldn’t figure out where the fragrance was originating-it was just everywhere. Other tropicals were showcased along with the orchids as they bloom at the same time- Bromeliads, Anthuriums, Bird of Paradise, and Gingers were all in exquisite form. Go to http://www.nybg.org/exhibitions/2015/orchid-show/ to read about the popular orchid evenings, dance exhibitions, poetry readings, and tips on orchid care that you can enjoy until April 18 in NYC in the Bronx. A sea of crimson poppies has sprung up in a 16 acre barren dry moat surrounding the Tower of London. Starting on July 17, a total of 888, 246 hand crafted ceramic poppies, each one representing a British military death in WWI, have been individually placed in the moat with the final one being placed today, November 11, culminating with a ceremony and a two minute silence to honor the dead. The art installation is called “Blood Swept Lands And Seas of Red” and is literally a sea of blood-red tide of poppies. Each poppy represents an individual who did not grow old. An army of volunteers will dismantle the exhibit, checking, cleaning and packing each poppy to be shipped to new owners. Each poppy was sold for 25 pounds or about $40 to benefit the six armed forces charities. More than five million visitors trekked to the Tower of London to view this incredible art installation. Photos courtesy of Amy Sparwasser.